If you are a cubicle dweller, you may have difficulty remembering what it was like to get up in the morning and be filled with enthusiasm about your day to come. As a micro-business owner, you are much more likely to view your workday with a sense of joy. Everyday challenges provide inspiration, instead of a sense of futility or doom. Even when you are hard-pressed to make ends meet, your freedom of choice is so much greater that problems are much more likely to be viewed as opportunities. Life is a different game when you set your own schedule. You can adjust your work day to balance the conflicting needs of family and income generation. As a writer-blogger-craftsman-publisher, who is a husband, grandfather, and cat owner, I get to juggle all sorts of conflicting demands. Since I have responsibility for setting my schedule, I have no one to blame if things go wrong. As a result, I try to make choices so things work out to benefit all concerned, including myself. For example, I got up at 3:00am this morning so I would be able to secure a place at the Charlottesville City Market. I fed the cats and departed the house in stealth mode so that Gretchen could catch a few more hours of sleep. At 5:00am I joined my fellow micro-business associates (exhibitors and produce sellers) as we drank coffee and watched the police and towtrucks clearing the parking lot in preparation for the saturday morning City market. By 5:30am we were all busy setting up displays for the 7:00am opening of the market. From 7;00 to 12:00 noon, the pace was non-stop. Eager shoppers swarmed through the market looking for the freshest produce and for all sorts of food, fresh baked goods, and craft work. Check out the C’ville Market photo album for recent images of this Saturday morning event. I met a few people who offered to help me get my book into various programs at UVA and into the UVA bookstore. I also had the pleasant experience of seeing two women come up to my book display and one said to the other, "That’s the book I was telling you about!" Word of mouth advertising. How sweet it is to actually see it in action! 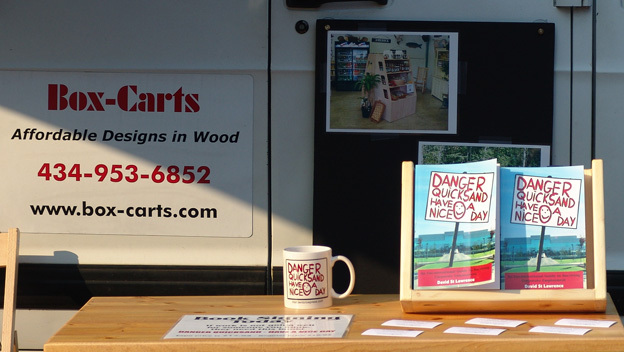 I have a new Affordable Designs in Wood banner sign for the top of my van. No one mentions it, but I notice that I have more requests for design quotes than ever before. I actually had people standing in line waiting to talk to me about projects! I was elated, but I couldn’t stop and enjoy the feeling, because I was sketching madly and taking down notes and email addresses. Two of the other exhibitors came by during the morning and did a hasty browse through Danger Quicksand – Have A Nice Day. They still have day jobs while they are ramping up their own businesses. My book struck a nerve and they laugh and promise to return and pick up a copy. I saw a change in how people approach my book this week. I sold two books where the person picked up the book, looked inside and bought the book within three minutes. One was a woman who bought it for her son, who works in IT. The other was a senior IT manager who had just been laid off because of outsourcing. By noon, I am wasted. The heat and 100% hunidity has taken its toll, but the day was professionally and financially rewarding. I break down the exhibit, load everything back into the van, and head for home which is 20 miles away. I unload the van, shuck off my sodden clothing, shower and crash for a few hours while Gretchen handles phone traffic and manages the affairs of her tree care company client. When I surface, all is quiet and I can catch up on my emails and fill an online order that has just been placed for my book. Those of you who are considering self-publishing might well consider doing fulfillment yourselves. There is incredible satisfaction seeing orders arrive and being able to sign and ship the book the same day. I feel much closer to my book buyers than if they were getting books through a third party and I had no visibility on how well they were being serviced. I get several chances to interact with buyers. I send them an email telling them when the order is being shipped. I write a note in the book when I sign it and I may write a note on the paid invoice asking them to email me if they have any questions. This entry was posted in Doing What You Love, Micro-Business, post-corporate, Self-Publishing. Bookmark the permalink. Very inspirational post, David – you make your own success in this world. That extra bit of effort every day is hard to maintain, but that’s what sets you apart from “the average.” Hats off to you. Thanks for the acknowledgement, but I only do this once a week. The rest of the time, I keep a less arduous schedule of wake up and blog, have coffee with Gretchen, work on designs, eat, market my book, blog, eat, etc., all interspersed with emails and calls with friends. The essential part of any schedule is taking time to stay close to the people who support you in your work and your life. I can do that easily now, where I couldn’t seem to find the time as an employee. I think it’s because I do fewer non-essential activities now. As a cubicule-dweller, it was really inspirational to read your post. In fact, I’m navigating through the archives, and it’s a great blog. Freelancing in part-time is something I’ve been thinking of experimenting with, and I’m getting some clues of your own experience (even though I’m just 30). Great blog, I’ll keep up with it, it’s my Bloglines list. Thanks so much for sharing your point of view and experience with the rest of us. David, it appears, as time pass by and your days as a cubicule-dweller become more and more of the past, so your wounds from the digital fields are healing and all that is very positive because it allows you to put behind the past and to move on, as you are currently demonstrating. but I managed to remember enough to write a book in the hopes that it would help others. Since I have left corporate employment, I see clearly that the companies I dealt with felt they had no other choices. My next book will explore the choices they ignored and what it cost them. While you guys were Floyd Feasting, I was Floyd Festing. I had another blind blogger date and sold half a dozen books…just goes to prove what you were saying in the post. All the best! Thank you for your post, David. I started my micro business 2 years ago now as a technology marketing writer. I have no interest at all in growing into an agency, since I sought this lifestyle so I can be home for my young son. (I’m a single mom.) On the other hand, I like money too! I have a personal financial goal I’m heading for which is quite possible for my type of business. In spite of the occasional feast or famine cycle I experience in the meantime, I have never been happier in 30 years of working.